This small wooded valley has a surprising variety of plant species and birds and boasts a beautiful waterfall. The woodland surrounding Stephen's Vale was originally the hunting woods of the Earl of Warwick. The beautiful woodland is awash with bluebells in springtime and brightly coloured leaves in the autumn. 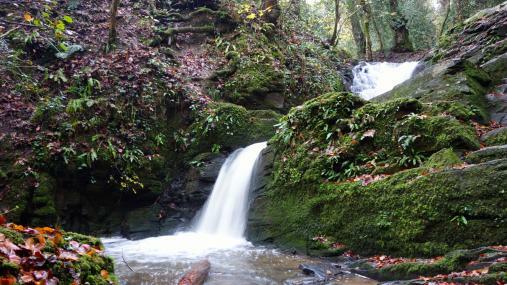 Popular with walkers, the highlight of the woodland is the waterfall. For ease of access, it is best to approach the waterfall from the downstream side. The steep sides of the valley have a varied woodland ground flora including wood anemone, moschatel (townhall clock), goldilocks buttercup and hairy woodrush. The slightly acidic character of the woodland flora reflects the sandstone rocks which underlie the valley. Outcrops of the reddish rock are obvious on the steepest slopes. Damp areas on the valley floor have the locally scarce small teasel plus carpets of opposite-leaved golden saxifrage and a stand of the huge-leaved butterbur. The stream is clean and well oxygenated with a stony bed, ideal for dipper and grey wagtail, both of which can be seen here. Interesting insects include the dark bush cricket and the bloody-nosed beetle, so named because of its habit of excreting a red blood coloured fluid from its mouth when disturbed. Brimstone, painted lady and red admiral butterflies can be seen in sunny areas. The site was donated to the Trust in 1995 as a gift from FBG Trident Limited. Management of the reserve is carried out by the Avon Wildlife Trust in partnership with the Cam Valley Wildlife Group. High Littleton (between Hallatrow and Clutton). Paths are very steep for the less mobile. There is a small carpark on the Greyfield Woods side of the Vale, leading off from Greyfield Road.